You don't need to supply your own boat to take advantage of a memorable day on Branson's lakes. A variety of Table Rock Lake and Lake Taneycomo marinas offer rental boats, WaveRunners and all equipment needed to have a day of fun on the water. Read on to find out how and where to rent a boat in Branson. Branson's State Park Marina offers boat rentals, WaveRunners, water skiing, tubing, parasailing, scuba diving and even guided fishing trips on Table Rock Lake. 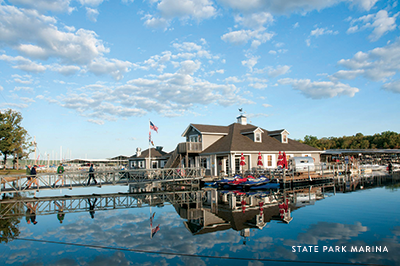 Plus, the State Park Marina's boathouse provides everything you need for a day on the lake, including apparel, fuel, bait and tackle, snacks and even sunscreen. Featuring more water activities than any other marina in Missouri, State Park Marina offers rentals of slide boats, wake boats, ski boats, pontoons and even bass boats for as little as $119 for two hours. More adventurous visitors can rent a WaveRunner for as little as $99 an hour or $389 for a whole day. Also available is SCUBA diving in the crystal-clear Table Rock waters for as little as $140. State Park Marina offers parasailing for $100 and excursions aboard the Spirit of America sailing catamaran for just $34.97 (12 and under) and $39.95 for adults. Click here to check out their website. Open year round, the Indian Point Marina offers rental pontoons, tri-toons, ski boats, deck boats and WaveRunners. Skiing, tubing and fishing at prices ranging from as little as $60 for one hour to as much as $2280 for an entire week. Indian Point also offers SCUBA diving lessons and the only two-story floating café on Table Rock Lake, serving breakfast, lunch and dinner while featuring live entertainment every Saturday in the summertime. Try angling by utilizing Indian Point's fishing guide service to greatly increase success during their fishing excursion on Table Rock Lake. Click here to check out their website. 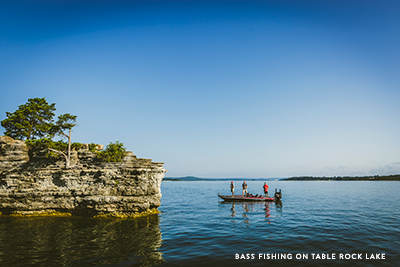 Branson visitors hoping to hook plenty of fish during their day at Table Rock Lake can rely on Bass Pro Shops' Long Creek Marina to rent a fully-equipped Tracker bass boat. But the marina doesn't cater only to anglers. In fact, its Ski School offers instruction to expertly ride slalom, kneeboards and wakeboards. Even boat enthusiasts who are just along for a ride can reserve a licensed boat driver for $100 per hour. Likewise, fishing guides are available to enhance your fishing trip for as little as $275 for a half-day experience, complete with boat, guide, fuel, oil and fishing equipment. Click here to check out their website. Branson visitors who prefer to boat and fish Lake Taneycomo can rent one of Lilleys' Landing's fleet of white river jon boats, bass boats and pontoons. No reservation is needed to rent a boat for either a full or half day, and each rental includes life jackets and a landing net. Anglers who wish to troll around looking for the best fishing hole can also add a trolling motor to their rented boat for an additional charge. Don't worry if you haven't brought your tackle box, Lillys' Landing features a fly and tackle shop that is fully stocked with bait, tackle, flies, jigs, lures and even rod and reel rentals. Rates range from as little as $65 for a two-hour jon boat rental to as much as $329 for a full-day pontoon boat rental. Click here to check out their website. Branson's famous Chateau on the Lake isn't only a premier resort with a gourmet restaurant, but also a marina offering boat rentals. Choose from slide boats, wake boats, ski boats or luxury pontoons at rates beginning at $159 for a two-hour excursion. Marina customers can also rent WaveRunners and reserve a professional fishing guide for as little as $399 for a half-day. Click here to check out their website. Located on the upper end of Lake Taneycomo, Fall Creek Marina rents boats to both guests at the adjoining resort and the general public. Boaters and anglers can choose from pontoons that can hold as many as nine people or 20-feet fishing boats that can hold up to six. Either four- or eight-hour excursions are offered for anywhere from $95 to $150. The marina also offers just about anything needed for a relaxing day on the lake, including bait, tackle, fuel, snacks, drinks and even fishing licenses. Fall Creek also offers guided fishing trips, led by USCG-licensed and insured guides with years of experience. Anglers can even fish right off Fall Creek's 500-feet, handicapped-accessible and lighted dock. Click here to check out their website. The family-owned and operated Branson classic on Lake Taneycomo rents out pontoon boats, bass boats, jon boats and recreational boats for half- or full-day excursions at rates ranging from $99 to $249. Less-experienced anglers can also take advantage of one of Scotty's Trout Dock's guide services, which provides not only a professional fishing guide, but also all needed tackle, fishing equipment, boat and fuel for anywhere from $295 for up to 2 people to $495 for as many as six. The guides clean and bag your booty so you don’t have to. Just be sure you have a fishing license with a trout permit. Click here to check out their website. These are just a few of the marinas and boat rentals available in the Branson area. Just as some may seek to rent a boat for a day of fishing, others might prefer a boat for no other reason than to enjoy a relaxing day on the water. To truly get the most out of the Branson-area fishing, boating and water sports available, visitors can choose to rent a boat in the area and with the features that suit them best. Most importantly, visitors should be sure to obtain the necessary licenses and permits either before their trip or at the marina of their choice. You can read more about adventures and activities you can have when you visit lakes in the Branson area here.